This line of foam earplugs provides an effective single-use solution to combat noise-induced hearing loss. 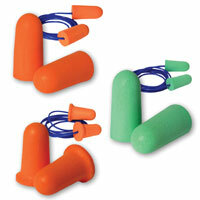 Tested in accordance with ANSI S3.19-1974 standards, these disposable earplugs feature soft, slow-recovery foam. They are easy to roll down and insert, and expand slowly for a low-pressure fit in any size ear canal.